The Hockey Blog Adventure: Lazy Links: hitting, etc, blah blah blah ARE THEY BACK YET? Lazy Links: hitting, etc, blah blah blah ARE THEY BACK YET? Because Cal Clutterbuck just set an NHL record for most hits in a season (317 and counting), I decided I'd take a look at the hitting totals of the Bruins. 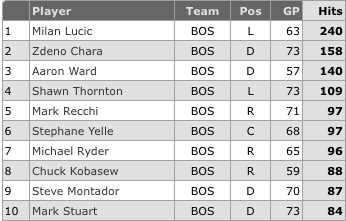 The top ten is pretty predictable: Lucic, Chara, Ward, Thornton, Recchi, Yelle..... Those are the top six. And your number 7 most-hittingest Bruin? Which is kinda crazy, since he has an unreal shot and doesn't look like much of a hitter. Unfortunately, nhl.tv doesn't have videos of his hits neatly lined up like they do his goals. Still better than any other league's video site, though. Back to what I was saying, whenever he doesn't score goals, you can always say "he's doing the right things everywhere else." I guess someone needs to check on the Wheeler-Krejci-Ryder line. Solid play from him. Thanks, Claude. The rest of the top ten are Kobasew, Montador, Stuart. Those make a lot of sense. I find it interesting that our two deadline acquisitions both land in the top ten. Byron Bitz would be tearing up the charts in a hits/games category - he's got 60 in 28 games. The problem with this stat is "What is the definition of hit?" Home statkeepers may keep it differently than away stat keepers. It's a stat that's only been around for a few years, and as far as I know it doesn't have a real definition. I also don't know if they count penalized hits as hits, per se. Even with all that, it was interesting especially when Lucic was at the top of the list for the league (injuries have brought him down). There's still time to join the WCHB NCAA Tourney pick 'em before the first game today (3pm eastern, I believe). If your -other- tourney pick 'em bracket is shot (like mine) you should give it a go! Thornton has been rocking the vlog near-daily during this week. The Bear Cave lets us know about the P-bruins. They are doing well, even with the loss of Coach Gordon. Wil Wheaton is a kings fan. That team's got a lot of young promise. Unlike Wesley Crusher. nhlplayoffrace.com added a president's trophy tracker. Everyone at work has gone down to florida. In the last couple of weeks he had some great hits. More than a scorer - I love this guy!! !